The Volkswagen Tiguan is a compact SUV that competes with everything from the Nissan Qashqai and Kia Sportage to the BMW X3 and Range Rover Evoque. The Volkswagen Tiguan does pretty much everything a good family SUV should. It’s stylish, high in quality, massively practical and easy and relaxing to drive. It’s not the cheapest car of its type, either to buy or to run, but you won’t feel short-changed by the car you get for your money. 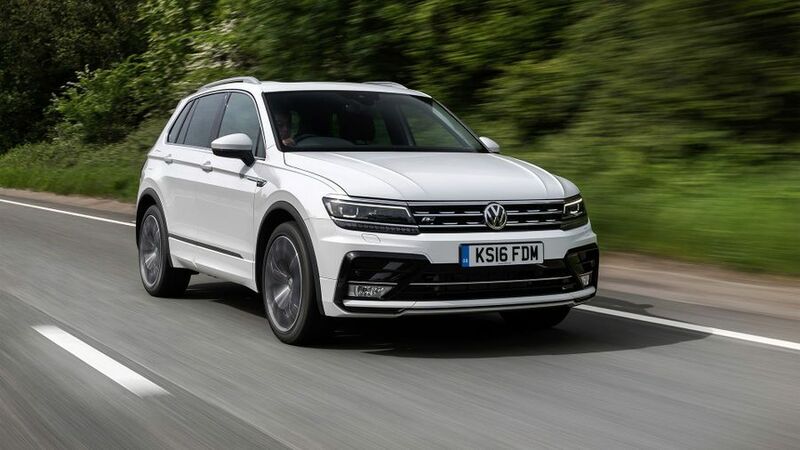 Volkswagen is not a company famed for its radical design, but although the Tiguan’s styling certainly displays the firm’s usual fondness for conservatism, it’s a fraction more outlandish than other VW models. With headlight clusters that feature strip-style lighting, a chunky-looking grille, beefy bumpers and plenty of character lines, there’s lots of interesting stuff to look at. The fact it’s longer, wider and shorter than the car it replaces also means it has a more hunkered-down stance on the road. Precisely how sharp your Tiguan will look depends on which trim level you go for, and each step up brings a few more styling goodies. All models come with alloy wheels, while stepping up from S to SE earns you a few more bits of chrome. SE L gets you a rear diffuser while R-Line models get a sporty body kit and a lowered ride height. You expect a fair slice of quality from any Volkswagen product, and the Tiguan certainly provides enough of it to keep you satisfied. There are plenty of soft-touch materials dotted around the cabin, and although some panels – like a couple in the doors and in the footwells – aren’t of such sterling quality, they feel very solid and hard-wearing. Less impressive, though, are the folding picnic tables in the back that are standard on all but the S model, which look and feel disappointingly cheap. That said, ergonomics are a definite high-point, thanks to a simple touch-screen infotainment system with sharp graphics and a logical set of menus, and an intuitive, clutter-free dashboard layout. SE L and R-Line cars also have a large digital information screen instead of conventional dials, which can be configured to display different information. All versions have bags of adjustment for the driving position and a great view out in all directions. 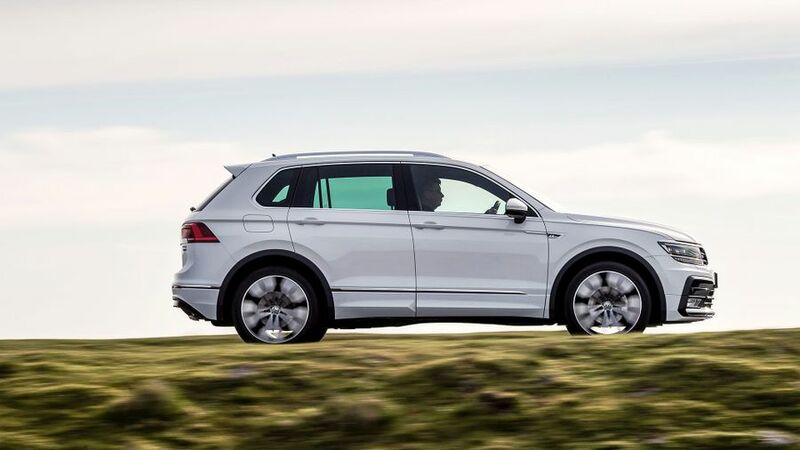 The latest Tiguan is considerably bigger than the car it replaces, and that can really be felt inside the cabin. You’d expect plentiful space up front, but you also get bags of legroom in the back, and that’s regardless of where you set the sliding rear seats. Headroom is also generous, even with the panoramic roof you get on high-end models. The boot is even more impressive, with the enormous 615-litre loadspace being an incredible 145-litre improvement on its predecessor’s and comparing extremely well with rivals like the BMW X3 and Honda CR-V. The split-folding rear seats don’t quite lie perfectly flat when you drop them, but you’re not left with any steps in the load floor and there’s virtually no lip to haul heavy items over. Cars like these are most often used as family carry-alls, and that means that a comfortable ride is very high on the list of priorities. The Tiguan does a pretty decent job, too. The ride does have a slightly firm edge to it on particularly rutted road surfaces, but it always stays smooth enough to keep your and your brood comfy and relaxed. The front-wheel drive versions we drove stayed smoother than the four-wheelers, but none of them will have you wincing. That includes the R-Line, which has a suspension that’s lowered by 15mm, but even so, there’s no deterioration in comfort. The handling is generally pretty tidy, with plenty of grip, decent body control and nicely weighted steering. Obviously, versions with four-wheel drive give you slightly better on-road traction, and with a reasonably sophisticated set of off-roading aids thrown in, the Tiguan might also get you a bit further into the countryside than you might expect. You can also specify your car with an adaptive suspension that changes its behaviour according to which driving mode you select, but we wouldn’t bother. The difference it makes to the ride and handling is negligible, making the car no better to drive, so it’s not worth spending the extra cash. So far, we’ve only had the chance to try a couple of the several engines available. The first of these is the 150 horsepower 2.0-litre turbodiesel that will undoubtedly be the biggest-seller. 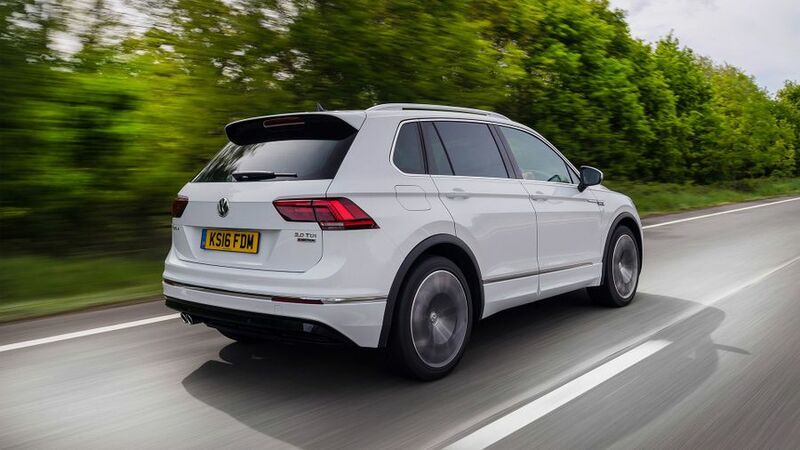 Despite the Tiguan’s hefty body mass, the engine is more than capable of hauling the car around in a reasonably purposeful manner, although it doesn’t quite feel as quick or as muscular as the power output suggests. Things do feel a bit perkier if you can live without four-wheel drive, though. The six-speed manual gearbox you get as standard has a nice slick action, and you can also have the car with a seven-speed twin-clutch automatic transmission. It’s smooth enough, but the changes can occasionally feel a little slow and laboured, and there's an irritating - and sometimes slightly alarming - hesitancy when you're pulling away from a standstill. We’d stick with the manual. The other engine we’ve tried is a 2.0-litre petrol with 180 horsepower, mated to the automatic gearbox. Again, the performance feels sprightly, if not quite as strong as the horsepower figures suggest, and the gearbox can occasionally feel a little undecided. The petrol engine is very smooth, however, and it also sounds really good, but it’ll be the hefty fuel consumption figures that’ll push most buyers towards a more sensible engine choice. With the Tiguan offering such a wide range of engines, gearboxes and driven-wheel configurations, it’s a very mixed bag on efficiency. The cleanest version, which has a 113bhp 2.0-litre diesel engine, front-wheel drive and a manual gearbox, just manages to bust the 60mpg barrier and has CO2 emissions of more than 120g/km. Considering that (admittedly slightly smaller) SUV rivals like the Nissan Qashqai are achieving figures of 99g/km these days, that’s not all that impressive. The figures deteriorate further as you add twin-clutch gearboxes and more driven wheels, but most of the diesel options still sit above the 50mpg mark. The petrol versions, on the other hand, all fail to beat this threshold. Prices aren’t all that cheap by the standards of the class, but they feel fair for the amount of car you get, especially considering the generous kit on offer. The desirable badge and strong image should help keep resale values strong, too. If you own the previous generation of Tiguan, then Warranty Direct’s Reliability Index makes for some pretty grim reading. The model scores rather poorly in the study, and Volkswagen doesn’t figure particularly highly in the manufacturer standings, either. We can only hope this version, based on VW’s latest architecture, fares a bit better when it comes to mechanical dependability. Even the three-year/60,000-mile warranty isn’t particularly generous compared with what some rival manufacturers are offering. The Tiguan was crash-tested by Euro NCAP under the stringent 2016 regulations, but the generous amount of safety kit provided as standard helped it achieve a full five-star rating. The standard roster includes seven airbags (eight if you choose SE L trim or above because you get an additional front passenger knee ’bag), stability control with trailer stabilisation, and active pop-up bonnet, lane-departure warning and emergency city braking. The range begins with S trim, and this provides pretty generous kit including remote locking, air-conditioning, four powered windows, automatic lights and wipers and a touch-screen infotainment unit that has a DAB radio and Bluetooth. Upgrading to SE trim gives you three-zone climate control, cruise control, all-round parking sensors and improved smartphone compatibility thanks to Apple CarPlay, Android Auto and MirrorLink. 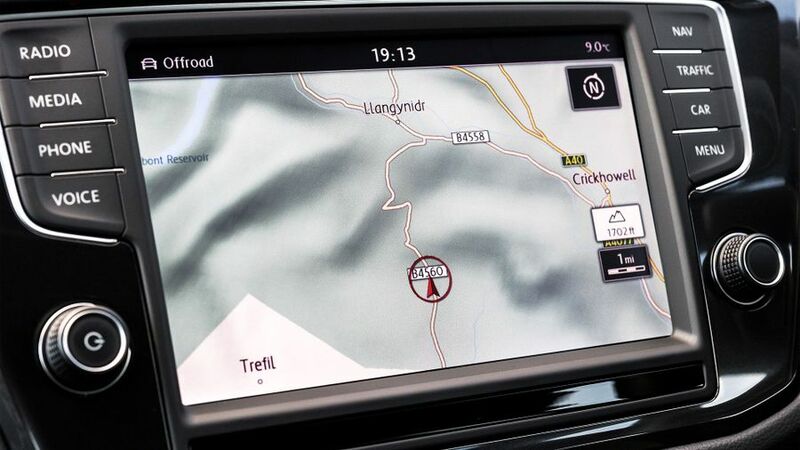 No prizes for guessing what SE Nav models add, while SE L cars have a heated front seats, a panoramic roof, the posh virtual dials and adaptive cruise control. The upgrades that R-Line models get are mainly cosmetic, but you get a sports suspension as well. It’s a bit weird, however, that none of the trims come with leather upholstery as standard, even the high-end ones that really aren’t cheap. 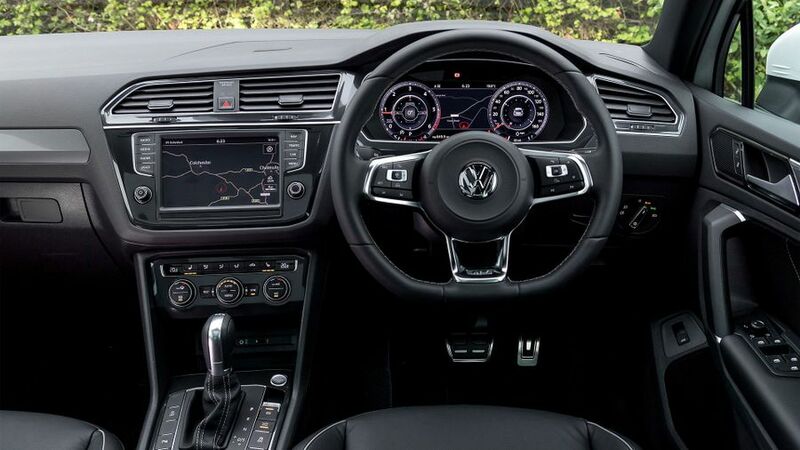 Because you like the rugged style of an SUV and the desirability of a Volkswagen badge. The Tiguan’s relaxed driving manners and practical, high-class cabin make it an excellent all-rounder that owners will simply love.